General Classrooms: 18 @ 900 s.f. = 16,200 s.f. + Science Labs: 2 @ 1,197 s.f. = 2,394 s.f. + Computer Labs: 2 @ 1,197 s.f. = 2,394 s.f. + Nurse's Station: 382 s.f. + Reception: 1,104 s.f. + Faculty Lounge: 743 s.f. + Faculty Workrooms: 3 @ 393 s.f. = 1,179 s.f. + Student Mall Area: 4,200 s.f. + Lobby: 975 s.f. 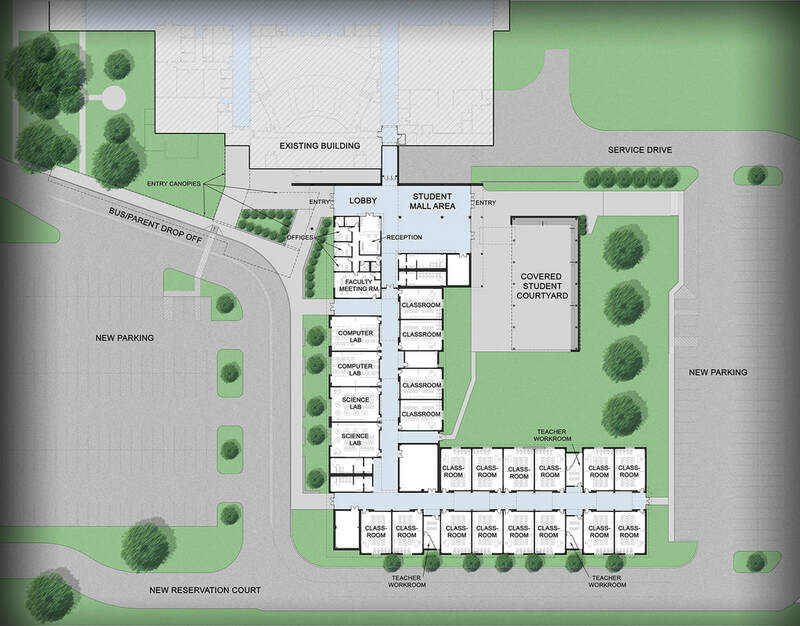 + Mechanical / Bathrooms / Electrical / Storage / Corridors: 17,309 s.f.+ Covered Student Courtyard Area: 5,000 s.f. + Covered Bus Canopy Area 8,400 s.f. ﻿H. L. Bourgeois High School, opened in November of 1973, is a public high school in Gray, Louisiana named after Henry Louis Bourgeois, an educator from Terrebonne Parish, Louisiana. For its first 40 years, the school primarily served students in grades 10-12. 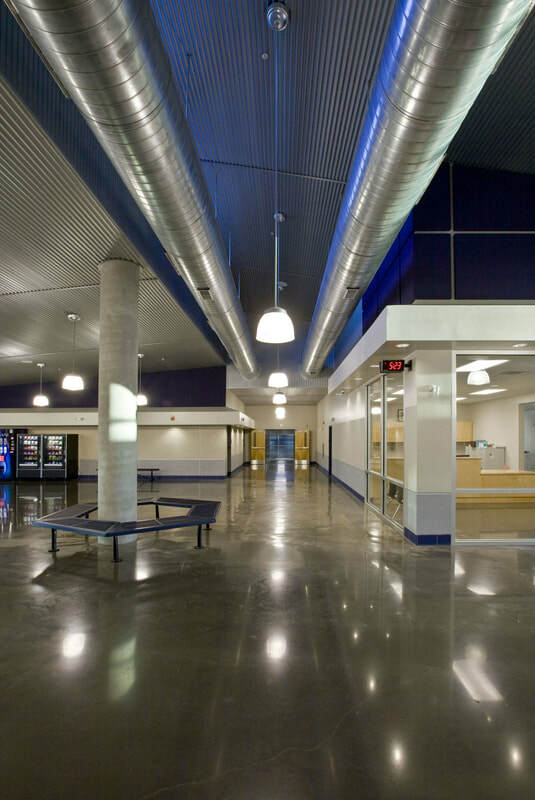 For the 2013-2014 school year, this new Freshman Center was completed to serve ninth-grade students. 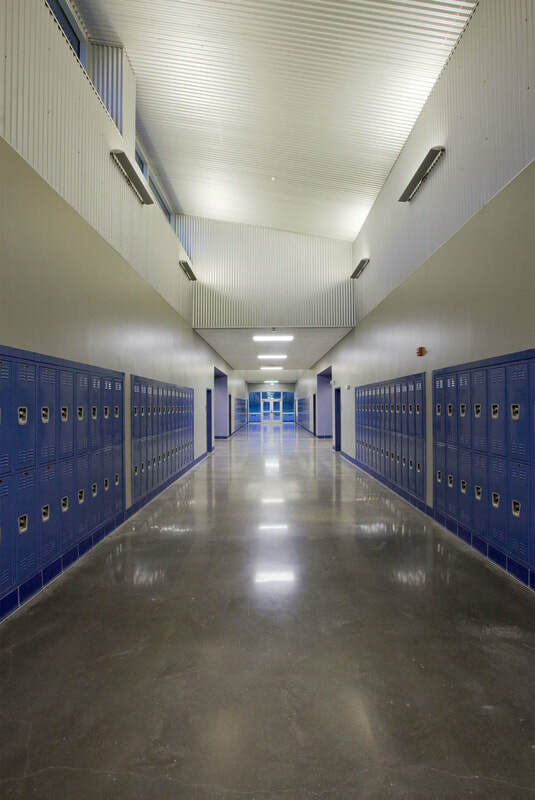 The school board believes that moving the freshmen to high school and into their own space will smooth the transition and improve graduation rates. The modern form and material palette of brick and precast concrete parallels with the existing school. The large precast concrete north wall of the Lobby and Student Mall serves as a threshold between existing and new. The continuous precast bands unite the form and the recessed precast panels visually slip behind the monolithic planes of tan brick and guide the eye around the structure. The L shaped floor plan bounds the outdoor student gathering area and creates a clean geometry allowing circulation to flow easily. The new parking, service drive and bus loading area make for a better functioning facility during school hours and for after hour events. Several teacher workrooms were included in the program to promote team teaching. 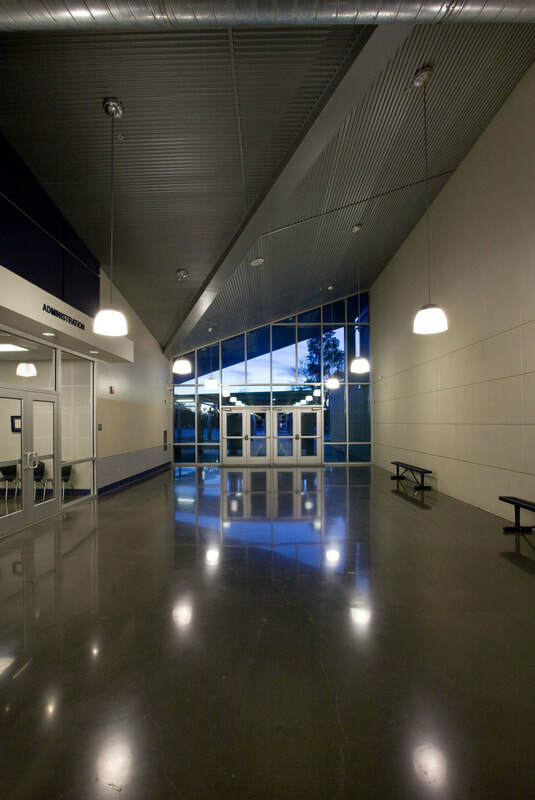 Generous spaces, north facing clerestory allowing light to flood the hallways, durable materials and sophisticated technological features create a high quality learning environment.